Warrington Museum & Art Gallery wanted to identify the location shown in a painting in their collection. 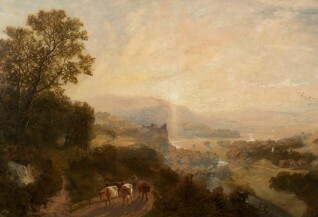 The painting was acquired by the museum in 1950, and was initially listed as ‘Halton Castle’. Between then and 2004 it was renamed ‘Beeston Castle’, which stuck. Speculation abounded: could it be Clitheroe Castle with the River Ribble in the foreground, a romanticised view of Chepstow from the South West, or Barnard Castle, with the River Tees and Country Bridge? Someone also commented that they saw overtones of Claude in the idyllic depiction! Andrew Greg, Art Detective Group Leader for 19th C except portraits, suggested the scene was a view of Hornby Castle that had been changed for artistic purposes, similar to Turner’s watercolour ‘Ingleborough from the Terrace of Hornby Castle’. Malcolm Fowles supported Andrew’s identification of Hornby Castle in Lancashire, which Martin Hopkinson compared with Alfonso Toft’s renditions of the same place. The location of Hornby Castle was therefore agreed.Warrington Museum & Art Gallery Warrington acknowledges the fit, and Art UK retitled the picture to ‘Hornby Castle, Lancashire’, and added a painting description. A future discussion could be started about the artist of this painting. Currently listed as by James Peel, this attribution was questioned by several contributors. Martin Hopkinson for instance drew parallels between this painting and Turner’s sketchbook drawings of the castle, in particular ‘Crook of Lune’, a watercolour from c.1820 at Tate Britain. Does anybody recognise the castle depicted in this scene?